— and the Bureau — all the power he wanted. Using photographs, cartoons, movie posters, and FBI transcripts, Master of Deceit gives readers the necessary evidence to make their own conclusions. Here is a book about the twentieth century that blazes with questions and insights about our choices in the twenty-first. Back matter includes an epilogue, an author’s note, source notes, a bibliography, and an index. Marc Aronson has a doctorate in American history and is a member of the graduate faculty in the library school at Rutgers. He is an editor and author of many award-winning books for young people, including War Is . . . Soldiers, Survivors, and Storytellers Talk about War, which he co-edited with Patty Campbell; Trapped: How the World Rescued 33 Miners from 2,000 Feet Below the Chilean Desert; and Sir Walter Ralegh and the Quest for El Dorado, the first Sibert Medal winner. Marc Aronson lives in New Jersey. MASTER OF DECEIT is a masterpiece of historical narrative, with the momentum of a thrilling novel and the historical detail of the best nonfiction... This is as much about how history is written as it is about Hoover and his times... Written with the authority of a fine writer with an inquiring mind, this dramatic story is history writing at its best. Aronson’s stimulating questions and his occasional use of first- and second-person, will wake up readers accustomed to less in-your-face historical narratives. The book does an excellent job of creating parallels between America’s anticommunist efforts and the current fight against terrorism as it questions the price of security and the media’s roles in keeping secrets. Period photographs, movie posters, cartoons, and FBI documents supplement a biography abounding in historical context. Relying on wide reading and vast research, Aronson paints a nuanced and evenhanded portrait of a man who was complicated, almost certainly neurotic, and who had an iron will to control–both himself and others. Thoroughly discussing the FBI’s role in law enforcement, the McCarthy witch hunts and HUAC, campaigns against Dr. King and civil rights, and comparing the egregious violations of individual rights and due process committed by the agency to the conduct of post-9/11 containment and treatment of Arab Americans, this book is a must for high school students. The biography of an American villain, a history of America during the last century, and a meditation on what it means to be American in the present era—Aronson delivers another provocative book. This biography is an unflinching portrait of an insecure, scheming zealot who conflated communism, civil rights, and the antiwar movement into a singular, immeasurable menace and dedicated himself to eradicating it... Large black-and-white reproductions of photos, internal memos, and cultural artifacts document a troubled man on a mission... Most compelling is the afterword, wherein the author expresses the challenges and fears he faced exposing the underbelly of the FBI under Hoover, making this both a gripping historical investigation and an instructive example of the researched communication of ideas. Between the photographs and documents, Aronson allows readers to pause and contemplate the viewpoint presented. Even as he seamlessly connects political and social past and present, there is a stunning amount of detail. In the age of multimedia, Aronson dutifully ties in movie titles and Internet sources to supplement specific incidents, constructing a richly researched biography highlighting a tumultuous period of American civil rights. Marc Aronson has written a powerful and thought-provoking book. His devastating, but nuanced portrait of the life and career of J. Edgar Hoover captures the impact of the long-term FBI director on American politics and thought. His is a cautionary tale of the costs of secrecy and of the fears engendered by blind fears over hyped security threats. MASTER OF DECEIT is simply outstanding. Marc Aronson explores the intersection of personality and history in a way that not only records the times and events, but actually illuminates them. A powerful book that serves its title well. 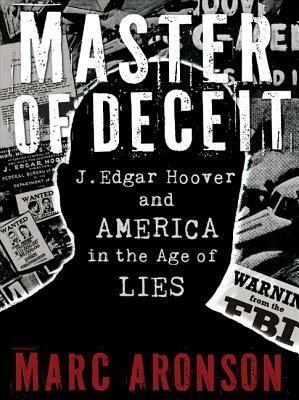 Aronson untangles the complex history of a master (J. Edgar Hoover) who created, manipulated, and guarded the nation’s “truth.” This is an important book, not just for its subject matter but also for its approach. Aronson skillfully shows that history is more than fact; history is a location: it’s where the reader positions himself or herself and what the “masters” do with the facts. A riveting read. Aronson chillingly recounts the extent to which many American lives were manipulated and ruined. Using posters, photographs, comics, and a rich text, Aronson delivers information about a tumultuous period of American history and one of it’s most powerful figures. This title is highly recommended, and might even prompt some passionate discussions among parents and their teens.